Gathered here, the three discs with Felix Mendelssohn’s symphonies recorded in 2007 and 2008 by Andrew Litton and his Bergen Philharmonic Orchestra were warmly received by the reviewers when they were first released. While each instalment, according to the BBC Music Magazine, demonstrated ‘the same wide dynamic range, eloquent phrasing and attention to detail, always with an ear for its contribution to the bigger picture’, performances of individual symphonies were hailed as ‘an exhilarating, thoroughly enjoyable Italian, superbly played and recorded’ (No. 4, Gramophone), ‘finally a Scottish that I have been able to listen to repeatedly with sheer delight’ (No. 3, klassik-heute.de), ‘suitably glowing, with an ideal balance between orchestral sound and chorus’ (No. 2 Lobgesang, Financial Times), and as bringing out ‘all of the rugged Beethovenian character in the Reformation symphony’ (No. 5, MusicWeb International). But this box set also gives the background to the symphonies for full orchestra, through the inclusion of the composer’s 12 string symphonies (and an incomplete 13th), written by a boy not yet fifteen. While forming a striking proof of Mendelssohn’s enormous, and enormously precocious talent, these works also allow us to discover the influences absorbed by the young man, who only one year later would compose his Symphony No. 1. The recordings, with the Amsterdam Sinfonietta conducted by Lev Markiz, were described in Fanfare as ‘absolutely lovely’ with ‘an exuberance that seems as fresh as that of the youthful composer himself’. 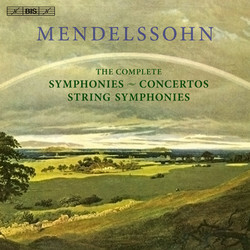 And as if all this wasn’t enough, a further four discs offer all of the eight concertos that Mendelssohn composed. These include the youthful works with string orchestra accompaniment (concertos for violin, for piano, for violin and piano, and for two pianos), as well as the mature works for violin and for piano and full orchestra, performed here by Isabelle van Keulen ‘with a soft tone like the finest-spun silk - plus strength to match, when required’ (Gramophone), and Ronald Brautigam, in what has been described as ‘one of the great piano recordings’ (In Tune).